Whenever the start of a new year approaches, many make the resolution to quit their 9 to 5 job and become their own boss. It’s a great route to choose, but is not without its challenges. Thankfully, you can overcome these more easily by cluing up on self-employment. Join us as we identify everything you need to know about it before making the leap. A likely motive for becoming your own boss is the opportunity to have control over your working hours. Whilst some may be able to achieve a better work/life balance as they can fit their tasks around personal commitments, such as children or social activities, for others self-employment can result in the opposite. Many struggle to separate their two lives, particularly if they are working from home. This can cause overworking, leading to stress and reduced energy levels. A way around this is to ensure you take regular timeouts during your working day, as well as put in place dedicated slots where you can switch off for long periods. But you could also face the opposite issue – where it’s difficult to maintain a work/life balance because of hampered productivity. A slump can be triggered by a lack of structure in your work schedule, along with too many disruptions. We’ve outlined some simple ways you can have your most productive workday on the blog. It is a good idea to ensure you’re prepared for how self-employment could affect your personal life too. For example, you may find difficulty getting a mortgage as many lenders require two or three years’ worth of business accounts. You might need to think about when the best time for life changes are, such as purchasing property or having children. Much of the instability of being your own boss is the lack of a steady cash flow. Whilst you should have the prospects to earn more than you do with a 9 to 5 job, you’ll need to make sure you will have a solid income coming in every month. This may prove difficult if you’re not accustomed to acquiring your own work. There are many ways you can prepare for this. One idea is to, prior to taking the leap, undertake freelance work alongside your day job. You’ll be able to set aside some extra earnings in case going self-employed full-time doesn’t provide enough money to pay the bills straight away, and you’ll also determine if there’s enough work available for you once you start. When working your existing role alongside self-employment, ensure you get the balance right to make the process as easy as possible. Freelance work will also get you used to sourcing your own customers, and seeing if it’s something you can be successful at in the long term. You’ll be able to let free your entrepreneurial side and confirm which aspects of onboarding clients you excel at. It might be, for example, that you’re good at gaining business via networking, or you’re better at securing it through online channels. If this isn’t something you have the time for before quitting your current role, you can still get a taste for self-employment. Simply researching the market will enable you to see if there is a sufficient amount of demand, and the channels you can use to bring in business. Another thing you might not consider before starting up by yourself are the outgoings associated with it. Whilst there are many ways to cut down on these, such as working from home, you’ll still likely come across unexpected expenditures. Therefore, think about what you might need to invest in. Remember, you’ll be working for yourself – there will be no employer to reimburse your expenses for you. A key investment is insurance. Employers’ liability insurance is legally required, though it’s unlikely you’ll need to pay for this unless you’ll hire staff members as soon as you begin self-employment. You’ll be covered in case an employee develops an illness or injury due to working for you. This can’t be neglected, not only from an ethical standpoint – you could be fined. There are two other main types of insurance to be aware of, both of which are optional: professional indemnity and public liability. The former protects you in the situation a client accuses you of negligence in the services or advice you provided. The latter is designed to cover you if a customer or member of the public is injured or suffers some sort of loss as a result of the work you carried out. It may not be necessary if you don’t come into physical contact with customers or the public. Both types will help with compensation and legal fees. Other costs that might be required to kick off your self-employment could include travel and vehicle expenditures if you visit clients, or the price of your branded or protective workwear. If you decide to go straight into working in an office rather than from home, then this will have a fee attached – as will any related costs like stationery and equipment. Whilst these may be unavoidable expenses, many can be offset to reduce your tax liability. Although you can potentially reduce the tax you pay by claiming for allowable expenses, you will no longer have an employer to sort this out for you. In addition, you’ll likely have to file a Self Assessment tax return. This can be a complicated set of affairs, especially if you have no prior experience with the submission process. Your operating structure will have an impact on the tax you pay too. A limited company is generally considered the most tax-efficient route if you anticipate profits in excess of approximately £40,000 (although this can vary depending on other income you may have), but this might not be suitable for your situation. We would always advise seeking professional advice on the suitability of a limited company. This form of business ownership also requires more administration and will most likely increase any accountancy fees. That’s why it is a good idea to use Self Assessment software. GoSimpleTax will take tax off your hands. All you need to do is input the relevant information, and you’ll be able to see how much you owe. As you enter the data, it adjusts instantly, meaning you can see your real-time financial situation at any point in the year. It offers tax-saving suggestions too, enabling you to minimise the amount you’re liable for. On top of this, it allows you to submit various forms, such as the SA106 for foreign income. And you can use it from wherever you are to save more time – you can even submit the Self Assessment on a smartphone. 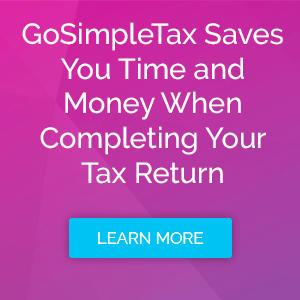 With GoSimpleTax, the hassle of the tax return is completely removed. To test out these features for free, take a 14-day trial today.